People hang up a poster with a photograph of Pope Francis in Havana, Cuba, Sept. 18, 2015. Flattered by a third papal visit in less than two decades, Cubans feel especially warm to Pope Francis for his fellow Latin American blood, humble image and help toward ending hostilities with the United States. Yet for all the goodwill on the streets of Havana ahead of the pontiff's arrival on Saturday, there are low expectations among Cubans that his three-day visit will spur any major domestic change on the communist-run island of 11 million people. "We're all grateful to him. He's already achieved a lot for Cuba," said Ariel Guerra, 30, a restaurant worker whose brother, in jail for killing someone while driving drunk, was among 3,522 common prisoners pardoned last week as a gesture to the pope. "What we really need is more opening, more investment, better salaries, but I don't think the pope can influence the economy," added Guerra, who works in the shadow of the 18th-century cathedral in Old Havana. Nevertheless, a warm reception awaits Francis when he follows in the footsteps of Pope John Paul's groundbreaking 1998 visit and Pope Benedict's 2012 trip. For starters, the Argentine-born pontiff is a fellow Spanish-speaker. There is also great affection toward him for his help in brokering secret talks to end Cold War-era hostilities between Cuba and the United States. The two countries restored diplomatic relations in July. And Francis' global reputation as a man of the people — driven in a regular car and occupying a modest Vatican guest house — has not gone unnoticed among generally plain-living Cubans. "He's different from the others. Humbler. You could even say he is a 'socialist' pope! So of course he's going to go down well here, isn't he?" laughed Juan de la Torre, 47, a devout Catholic who attended Mass during both previous papal visits. While Cubans expect little major change from the pope's visit, President Raul Castro will be hoping for a public indictment from Francis of the U.S. economic embargo on Cuba, still intact despite President Barack Obama's re-establishment of diplomatic ties. Both John Paul and Benedict repeated the Vatican's opposition to the embargo while on Cuban soil, to the delight of their hosts. Papal aides said Francis would raise the subject during his visit to Cuba and then the United States but would not dwell on it, given the delicate and evolving state of Washington-Havana ties. At the other end of the spectrum, dissidents opposed to the one-party state are praying for public encouragement from the pope, and help in securing the release of more than 50 jailed activists they consider political prisoners. "You can, and we are sure it is your wish, help the Cuban government understand it must not continue beating and arbitrarily detaining, each week, dozens of peaceful women, and other rights activists, just for thinking differently," the largest dissident group, Patriotic Union of Cuba, said in a letter to the pontiff. 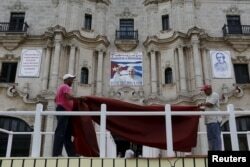 Workers make final touches to one of the podiums near Havana's cathedral, that will be used during the visit of Pope Francis to Cuba, Sept. 17, 2015. On the streets, however, where locals were avidly discussing all aspects of the pope's visit, few expected the pontiff to wade far into Cuban politics. Rather, some hoped for simpler tangible impact, like when Christmas was reinstated as a national holiday after John Paul's visit, and Easter after Benedict. "It's going to be a lovely visit for Cuba, especially for religious folk — but it won't go any further than that," said Gremy Fernandez, 35, who trained as a doctor but is working as a builder because it pays better. "There won't be any real changes." Behind him, as Fernandez and a friend walked home through a drizzly Revolution Square in Havana, a vast temporary picture of Jesus Christ vied for attention with permanent images of revolutionary heroes Ernesto "Che" Guevara and Camilo Cienfuegos.